Most of what the Duchess wears is well-received but a couple of Jenny Packham evening gowns in 2011 particular thrilled fashion aficionados. One was this beautiful rose-gold version to the ARK Gala on June 2011. It is a great color in general and with Kate's coloring its just a smidge similar to her skin tone but not so much so that it washes her out much. I think that slightly angled waistline does work really well with her long torso and the bias drape of the skirt really helps give shape to her narrow frame. The dress has such detail and such a soft and lovely neckline that I wish she would have chosen to have her hair off her shoulders for once to show it off. Now I'm going to nitpick my personal pet peeve here and comment for a bit on the strong shoulder line here. Kate's athletic frame needs a bit of help shaping a feminine figure and softening the strong angles, especially at the shoulder line. I just feel the puffiness of the top of the bodice adds sharpness to those angles instead of softening and minimizing them. The dress is really amazing and with a bit of tailoring it could have really flattered her strong, angular frame. Credits: Reuters via I.B. Times. The second was a silver one shoulder Grecian style gown, worn to a gala held at St. James' Palace. Now this one is much more flattering to her figure because it softens a lot of her hard angles. I think the full volume of this gown really helps evens out her top and bottom halves as well; she still looks super-slim and athletic, but more proportioned and her waistline here sits just right. The only good front side pictures I could find are below -- I particularly like the one on the right with Kate in the "boys club" since it looks like they're sharing a joke that seems to have passed her by! From what you can see, the asymmetric one shoulder really helps narrow out that wide shoulder line, and the one draped sleeve really helps soften those arms. I found a few gowns that are not exact repliKates but are very much in the "Kate-inspired" style of these designer original inspirations. First up is this embellished Adrianna Papell draped gown. (Its two different pictures from two different retailers but clearly the same gown.) The bodice is a draped and blousy asymmetric one sleeve style with bias godet skirt. I think it has a bit of elements from both, as if this would be the result if you meshed both gowns together. Retails for approximately $340 U.S.
Adrianna Papell gown - left via Von Maur; right via Macy's. This grey gown, also by Adrianna Papell, clearly mimics the Kate's silver Grecian gown above. It is a matte chiffon with asymmetric detail and draped shoulder with gathered skirt. 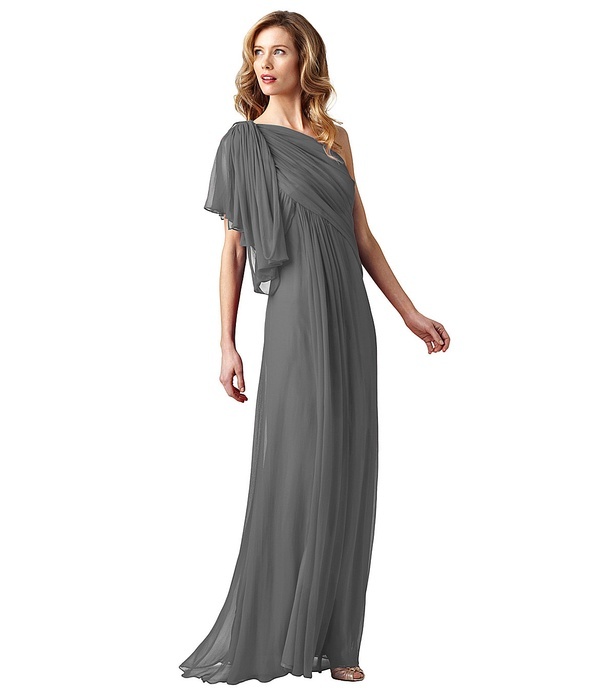 Retails for approximately $158 U.S.
Adrianna Papell via Dillard's - draped grecian gown. Last but not least is this lace Tadashi Shoji gown. 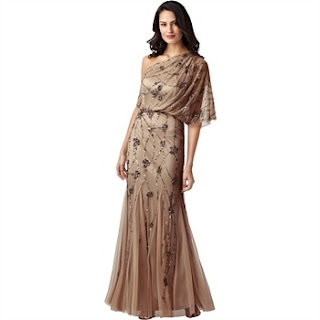 It is a champagne colored lace overlay full length gown with one shoulder. It is probably the least similar of the gowns but it still shares elements of both, such as the one shoulder and the metallic shade. 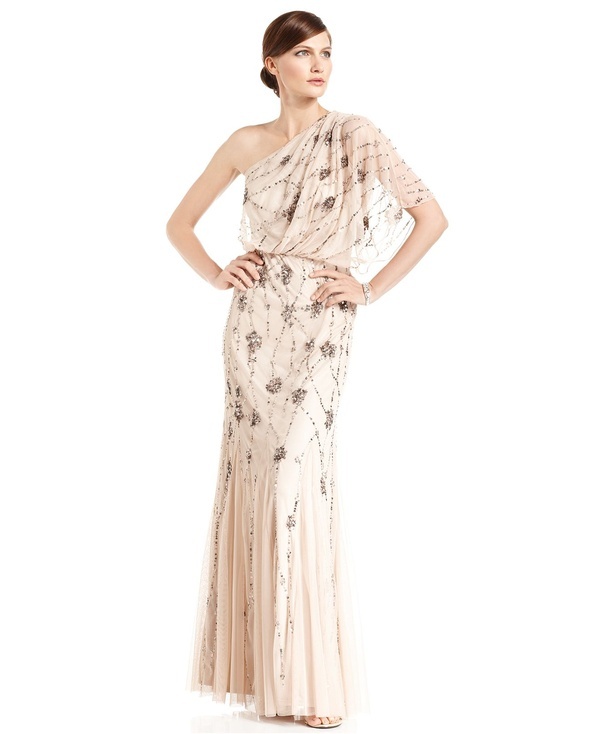 Tadashi Shoji via Bloomingdales - one shoulder lace and sequins gown.